NASA's Mars rover Curiosity prepares for a mini-drill test on a rock target called "Mojave" in January 2015. This photo was taken by one of the rover's hazard cameras. SAN FRANCISCO — Mission controllers have a better understanding of the problem that cropped up recently with the Mars rover Curiosity's drill, but a fix remains elusive. On Dec. 1, Curiosity detected an anomaly with its "drill feed mechanism," which pushes the rover's rock-boring drill outward from the turret on the end of Curiosity's 7-foot-long (2.1 meters) robotic arm. Mission team members quickly homed in on two likely causes: a problem with the mechanism's brake and an issue with the set of electrical sensors that report how the drill is rotating. "We were able to determine that it was the brake that's most likely the issue at this point, we think, and we were able to get some partial success in actually moving the drill feed and unstalling it, if you will," Vasavada said Tuesday (Dec. 13) during a news conference here at the annual fall meeting of the American Geophysical Union (AGU). But that success was short-lived, he added. "We've now determined that that problem is recurring," Vasavada said. "It went away, and we were very excited, but then it unfortunately has returned again in just the last day or so. So we're in the process of still figuring out how to go recover the operation of that drill feed." The drill, which uses both percussion (hammering) and rotating action to bore into rock, is a very important piece of equipment for Curiosity. Since its August 2012 landing inside Mars' huge Gale Crater, the rover has drilled into 15 different rock targets; Curiosity's analyses of the resulting powdered samples have allowed mission team members to conclude that Gale Crater was capable of supporting microbial life for long stretches in the ancient past. 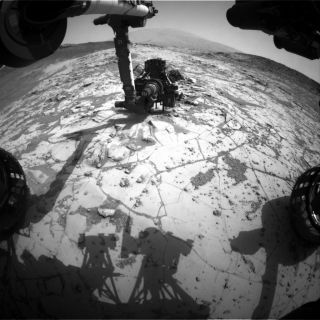 Curiosity has experienced drill problems before. For example, intermittent short circuits in the percussion mechanism temporarily sidelined Curiosity several times over the past two years or so. The team plans to proceed with caution in light of the percussion-shorts issue: Once the current drill-feed problem is resolved, mission controllers will direct Curiosity to use just the rotating action whenever possible, Vasavada said last week. Tests here on Earth suggest that rotary-only drilling will do the job just fine in many cases, he said. "We're pretty confident it'll work in softer rocks, like mudstone," Vasavada told Space.com here at AGU yesterday. "The harder rocks, we're not so sure." Curiosity is also experiencing a problem with the wind sensor on its weather-station instrument, mission deputy project scientist Joy Crisp, also of JPL, said during Tuesday's news conference. But the rover's wheels are holding up fine despite the rugged terrain in Gale Crater, and Curiosity is in good health overall, Crisp added.